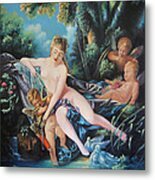 There are no comments for Venus Disarming Cupid. Click here to post the first comment. Inspired by the 18th Century painter, Francois Boucher, I attempted to recreate his painting Venus disarming Cupid. 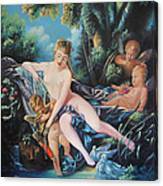 I have also heard it called Venus consoling Cupid and The Bath of Venus. This is a large 3 by 4 feet painting and took some time to accomplish through layering of thin paints to achieve a soft glow of skin tones. My personal touch to the inspired effort was unavoidable but I learned much from doing it and largely learned what an amazing painter he was to create such a masterpiece. The darkest areas of this painting are actually lighter than my photo. It is a difficult painting to photograph without reflections in the varnish so I leaned towards the detail in the subjects which darkened the edges.